﻿Join the Galaxy Quest crew! 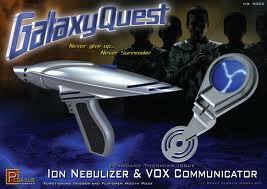 Build the ship from the sci-fi spoof film Galaxy Quest with this Galaxy Quest NTE-3120 N.S.E.A. Protector Ship Model Kit! At 1:1400 scale, this model kit includes the ship (measuring about 12 1/2-inches long), a nice base featuring the Galaxy Quest logo, and clear-blue parts for lighting. It even comes with a removable command ship, to boot! The Galaxy Quest N.S.E.A. 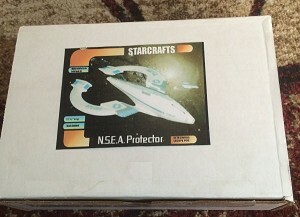 Protector Ship Model Kit makes a perfect gift for that sci-fan you know. 1:1400. 12.5" Long. GRP. Highly detailed kit. Includes base and decals. 1:1 scale. IP. Kit of a Thermian ION Nebulizer with working trigger and a Vox Communicator with spring loaded opening cover. Blue tinted clear parts included. Product Code: 9003.